The latest survivalist thriller from the New York Times bestselling author and founder of survivalblog.com gives readers an unprecedented look into a post-apocalyptic world resulting from an all-too-real disaster scenario. When looting and rioting overwhelm all the major US cities, Afghanistan War vet Ray McGregor makes his way from Michigan’s Upper Peninsula to his parents’ cattle ranch in Bella Coola, British Columbia, in remote western Canada. Joining him is his old friend Phil Adams, a Defense Intelligence Agency counterintelligence case officer based in Washington State. Reckless banking practices, hyperinflation, and government negligence have led to an unprecedented socioeconomic collapse in America that quickly spreads throughout the world. Lightly populated Bella Coola is spared the worst of the chaos, but when order is restored it comes in the form of a tyrannical army of occupation. Ray and Phil soon become key players in the resistance movement, fighting the occupiers in a war that will determine not only their own personal survival, but also the future of North America. Liberators depicts a world that is all too conceivable and terrifyingly familiar. 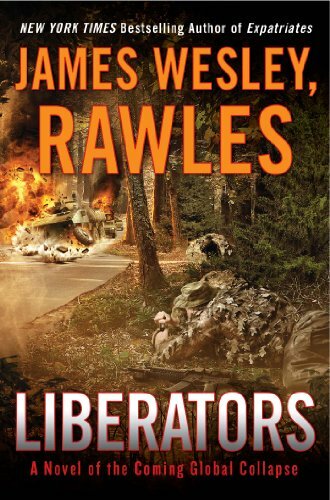 Fastpaced and packed with authentic information on outdoor survival, self-sufficiency, and small-unit tactics, James Wesley, Rawles’s latest thriller will resonate with his dedicated fanbase and encourage new readers to prepare for anything from lesser disasters to the dreaded worst-case scenario.